Medi-Cal is massive. It covers over 13 million people, more than the entire population of every state except Texas, New York, and Florida. As California’s state Medicaid program, it finances healthcare access for low-income children and adults as well as pays for a great deal of care for seniors and the disabled. Micah Weinberg, PhD, President of the Bay Area Council Economic Institute, and Patrick Kallerman, Research Manager at the Institute, co-authored this report. Camila Mena, Research Analyst at the Institute, also contributed to the report. The authors would like to thank Richard Figueroa, Eric Gold, Scott Graves, Michael Odeh, Chris Perrone, Yvette Radford, Katherine Rodriguez, Wade Rose, and Felix Su for their valuable insight and expertise. Over 50 years, Medi-Cal has grown from a niche safety net program to an essential foundation of the state’s healthcare delivery system and economy. It is the largest Medicaid program in the nation, with an annual budget comprising state and federal funds of more than $90 billion. Because Medi-Cal is the provider of healthcare coverage for such a large percentage of the state’s population and the second-largest item in the state budget, it is critical to understand the growth of Medi-Cal over time, its economic and social benefits, and its strengths and weaknesses. It is particularly important to recognize that this is now a program that covers millions of working Californians—and hence enhances their health and economic productivity—in addition to paying for the care of millions of children, the disabled, and elderly residents. In spite of the large absolute size of state spending on Medi-Cal, the program compensates healthcare providers significantly less than private payers and Medicaid programs in other states. Increasing access—and reducing the burden on the privately insured to fund California’s Medi-Cal delivery system—may require significant additional investments in this program. However, improving the Medi-Cal program is not simply about raising reimbursement levels. There are important reforms that will get the state better value for its spending on Medi-Cal, many of which are being advanced through a landmark agreement that California has just negotiated with the federal government. Medi-Cal enrollment has expanded significantly since its inception. Originally intended to provide health insurance to pregnant women, children in lower-income households, and the elderly and disabled with low incomes, the program covered fewer than 6% of the state’s population when it began in 1966. Over the years, the share of the enrolled population has ebbed and flowed as a result of economic cycles and policy changes. Medi-Cal Managed Care was introduced in 1973, and the Healthy Families Program began in 1998, expanding coverage to children in families with incomes above the traditional Medicaid threshold. As the program evolved, enrollment remained at under 15% of California’s population during the 1990s and under 20% through the 2000s. A watershed moment for the program came in 2010 as a result of the passage of the Patient Protection and Affordable Care Act (ACA). Most significantly, Medicaid became accessible to any individual with a qualifying income, when it had previously been unavailable to “childless adults” (nondisabled, nonpregnant adults without dependent children). A Supreme Court ruling allowed states to reject the ACA’s Medicaid expansion and the billions of federal dollars associated with it, and some states have done so. However, California’s implementation effort has been the most robust in the nation. From 2012 to 2015, Medi-Cal enrollment increased from 7.9 to 13.3 million, and the program now covers over one-third of the state’s population. One key goal of the ACA was to reduce the number of uninsured Americans. Though the subsidized private insurance marketplaces or “exchanges” get much of the attention, the primary way this goal has been accomplished is through the expansion of Medicaid. California has added 5.4 million new individuals to the Medi-Cal rolls since the passage of the ACA, whereas the total enrollment in Covered California has been hovering below 1.5 million, many of whom were previously insured in nonsubsidized plans. The addition of millions of individuals to Medi-Cal means that the program is serving an increasingly large and diverse population. Medi-Cal now covers the young and the old, the employed and the unemployed, many of whom we had previously allowed to fall through gaping holes in our state safety net. Employment-based health insurance still remains the way that the largest number of individuals in California receive coverage. Some 16.8 million individuals were covered under an employer-sponsored health plan in 2014, the most recent year for which we have comprehensive numbers for all sources of coverage. This was followed by Medi-Cal, which has grown significantly since this estimate; Californians who remain uninsured; and Californians covered by Medicare, the federal healthcare program for individuals over 65. We estimate that 4.67 million labor force participants—over two-thirds of the adults enrolled in Medi-Cal—rely on the program for healthcare coverage. However, many working Californians are not covered by their employers. 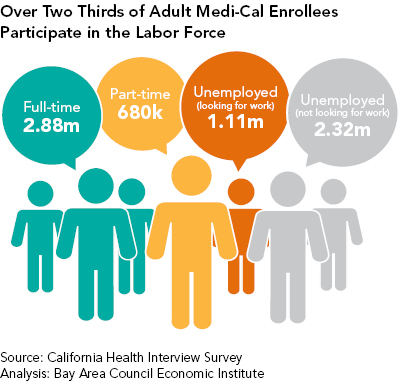 By 2014, 10% of the state’s full-time workforce and 20% of its part-time workforce were covered by Medi-Cal. Millions more working Californians purchased healthcare coverage on their own or remained uninsured, or were covered by Medicare or another public program. Focusing simply on the percentage of employed Californians covered by the Medi-Cal program therefore masks the fact that the absolute number of working people covered is very high, particularly in comparison to the total population of many other states. We estimate that 4.67 million labor force participants, over two-thirds of the adults enrolled in Medi-Cal, rely on the program for healthcare coverage. This figure includes 2.88 million full-time employed California residents, 680,000 part-time employed residents, and 1.11 million unemployed individuals actively looking for work. 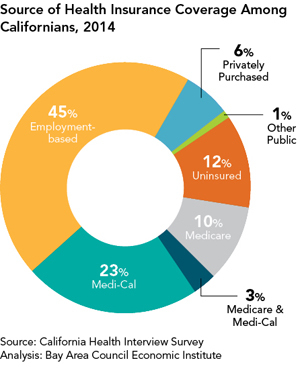 In addition, there are over 700,000 uninsured and fully employed Californians eligible for Medi-Cal but who are not enrolled, and over 280,000 part-time employed individuals eligible but not enrolled. Medi-Cal is an even more essential program for the state’s teens and children. The program covers nearly half of all children in California, many of them the children of working Californians. Overall, 2.8 million teens and children covered by Medi-Cal reside in a household where at least one parent is employed either full- or part-time. It is especially important to understand that this increase in Medi-Cal coverage is almost exclusively going to those who were previously uninsured rather than replacing or “crowding out” private coverage, which has remained stable in the state while rates of uninsurance have dropped precipitously from 22% before healthcare reform to under 11% in 2015. California is a large state made up of several distinct regions. Following the Great Recession, the economic recovery in the state has been uneven. 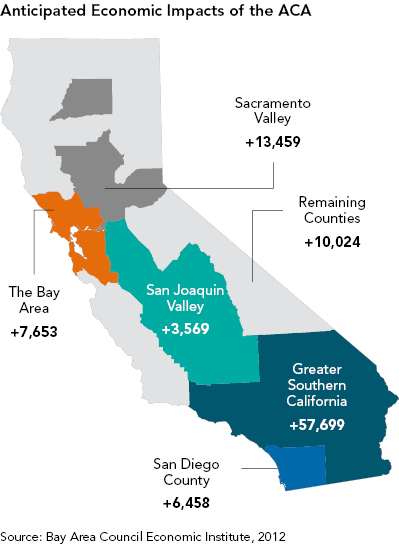 Coastal regions such as the Bay Area, San Diego, and Orange County have seen impressive growth, while inland regions such as the San Joaquin Valley and North State have lagged behind. Average earnings in these regions are also very different; hence higher shares of employed individuals are eligible for Medi-Cal in some regions than in others. Rates of Medi-Cal enrollment among the employed therefore vary significantly across the state. 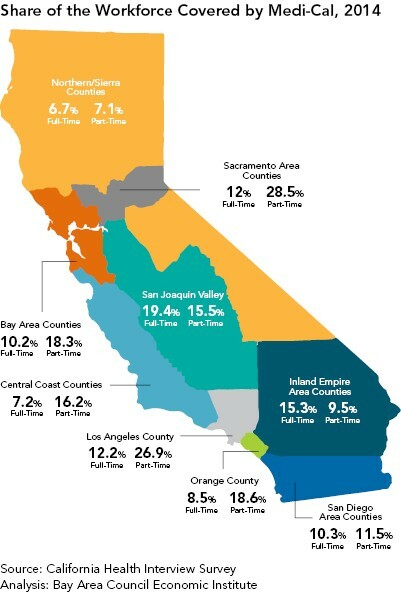 The North State, Central Coast, Orange County, San Diego and Bay Area regions have the lowest shares of full-time employed individuals enrolled in Medi-Cal. With the exception of the North State, these regions have done very well coming out of the Great Recession, recording low unemployment and a high number of well-paying jobs. By contrast, the San Joaquin Valley, the Inland Empire Area, Los Angeles County, and the Sacramento Area have higher rates of Medi-Cal enrollment among the employed. This is due to their higher proportions of lower- to middle-income jobs that do not provide health benefits. In the North State, the low share of working Californians covered by Medi-Cal is somewhat surprising. These rates are a result of relatively higher percentages of unemployment and high rates of uninsurance, though, rather than robust growth and higher wages. Of the relatively smaller percentages in this region who are employed and covered, fewer are enrolled in Medi-Cal. With a budget of over $90 billion, Medi-Cal is important to the state economy in a multitude of ways. As one of the largest payers in the state, Medi-Cal is essential to clinics, hospitals, and other providers administering services to enrollees. As a source of health insurance coverage to millions of working Californians and their families, Medi-Cal plays a critical role in ensuring the health of the economy’s labor force. In turn, these healthier employees live longer, remain in the workforce longer, and are more productive at work—all benefits that accrue to the state’s economy and to the state as a whole. The primary intention of Medicaid expansion is to provide more universal health coverage within the United States. However, Medicaid expansion has and will continue to have a significant positive impact on state economies. The program now pays for medical care and long-term healthcare services for just over 70 million Americans. Of the estimated $1 trillion cost for expanding the program through 2022, the federal government will assume 93%, or $931 billion. This massive influx of spending will have a direct positive effect on jobs and incomes in states that move forward with Medicaid expansion. A review of state-based economic impact analyses showed sustained job and economic activity growth in every state that conducted such a study. These positive impacts were anticipated in a 2012 Bay Area Council Economic Institute report that examined the expected impact of ACA implementation on California. The study provided an assessment of how the California economy might have been different in 2010 if the ACA had been fully implemented at that point. It found that full implementation in 2010 would have added 98,861 jobs and $4.4 billion in additional gross state output. Since the healthcare sector alone has added hundreds of thousands of jobs in the state since the passage of the ACA, these estimates now seem quite conservative. The Institute did not conduct an analysis specifically for the expansion of Medi-Cal, but Medicaid spending is a major contributor to that positive economic impact. Though some continue to make nonempirical claims that the ACA has had a negative impact on jobs, such claims are increasingly difficult to sustain in the face of more than 60 straight months of private sector job growth since the passage of the law. An economic slowdown will happen eventually in any case, but linking such a slowdown to the expansion of insurance coverage will be challenging, if not impossible, to do empirically. ncreased access to health insurance coverage also leads to an improvement in health status and reduced mortality and morbidity. Prior to the expansion of coverage under the ACA, millions of working Californians were uninsured, a factor that reduced their economic productivity. Medi-Cal coverage matters. Data from the National Health Interview Survey shows that uninsured individuals are over four times more likely to have no usual source of care than those with Medicaid coverage, and they are nearly three times more likely to go without care due to cost. Poor health leads to a reduction in productivity through missing work due to illness, attending work while ill, and reduced work output, whereas good health improves economic outcomes. Individuals with a lower self-reported health status are significantly more likely to drop out of the labor force, while improving an individual’s health status increases annual earnings by 10% to 30%. Looking at this correlation at an economy-wide level, the Institute of Medicine took an approach to valuing the health of the uninsured community similar to the methods used by the US Environmental Protection Agency in setting emissions standards and the Department of Transportation in setting seat belt and air bag requirements. The report sought to quantify the additional value added through insuring those currently uninsured. It found that the annual economic value of insuring every uninsured American was between $65 billion and $130 billion and concluded that the benefits of providing insurance outweigh the costs. One of the most concrete pieces of evidence we have on the direct connection between insurance coverage and productivity is the fact that, according to a major survey, employees with health insurance on average missed 4.7 fewer days than those without coverage. It also found that investments in preventive care had a positive impact on the number of healthy employees. To develop an estimate of the increased productivity that accrues to the California economy as a result of Medi-Cal, we used coverage and employment data from the California Health Interview Survey and wage data from the Consumer Population Survey. Assuming a gain of 4.7 working days per year as a result of being covered by Medi-Cal, the state of California experiences a gain of $1.7 billion in personal income per year as a result of the program.